In 1735 was published the first book of six volume set (the last book was published in 1677) of Jean Gaffin Gallon—Machines et inventions approuvées par l'Academie Royale des Sciences, depuis son établissment jusqu'a présent; avec leur description, in which are described several calculating devices. In one of the books (Tome 4) was described the calculating machine (so called machine arithmetique) of the French mathematician and inventor Hillerin de Boistissandeau (see biography of Hillerin de Boistissandeau). The machine of Hillerin is quite similar to the earlier Lépine's machine, so obviously de Boistissandeau was strongly influenced by Lépine. 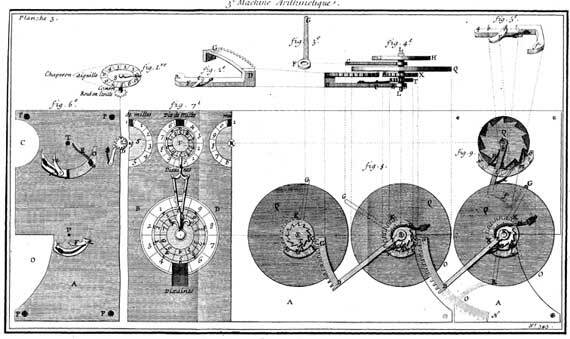 Actually in the publication (see the desciption of Hillerin's machines) there are three separate articles, which described three different machines, but the second and the third are essentially improvements of the first one. It seems at least one copy of the device was manufactured, preserved now in the collection of CNAM, Paris. The dimensions of the device are: height: 6.00 cm, width: 17.00 cm, length: 30.50 cm. The weight is 3.250 kg. Materials used are: wood, leather, iron, brass and textile. The machine of Boistissandeau has 6 digital positions, appropriate to the french monetary system in the 17th century. The rightmost position is for deniers, that's why its wheel is divided to 12 parts, the next is for sols (wheel is divided to 20 parts), remaining wheels are decimal (wheels are divided to 10 parts). Entering and resetting of the numbers is done by means of a stylus with 2 edges—short and long, which can be push in openings of the entering wheels. When is used the short edge of the stylus, then will be rotated only the upper (entering) disk and it can set to 0. When is pushed in the long edge of the stylus, then will be rotated not only the upper (entering) disk, but also the lower disk of the calculating mechanism, and the number will be entered in it. The small wheels, which are placed over the big wheels are working as revolution-counters and are used during a division operation. In these wheels is stored the quotient of the division, while bellow in the main mechanism is stored the remainder. The 5 wheels (marked with w in the upper figure), which are placed between the 6 small wheels-revolution-counters, can be rotated by means of a special rod. These wheels are not connected with the calculating mechanism and are used as a temporary storage for intermediate results. Bellow the each entering wheel there is placed a small window, in which can be seen digits, inscribed on the placed bellow wheel. Here can be seen the result of the calculations. Over the digital wheel actually are inscribed two rows of digits. The first row is used during the adding and multiplication, the second—during the subtraction and division. Which row of digits can be seen is determined by the rods (marked with B-B on the figure), which are moving a plate, covering one of the rows. Over the entering wheels are placed small axles, which are stopping the styles during the rotation of the entering wheels, and actually are determining which digit will be entered. Below the digital disk, which digits can be seen in the windows bellow the entering disk, are mounted on the same axes 3 disks. First disk is a pinion-wheel, which can have 10, or 12 (according to the digital position of the wheel) teeth. This wheel takes the carry from the neighboring position (this is the reason that the rightmost position doesn't have such wheel). After this wheel is placed one-tooth wheel, which during the each revolution will be engaged with the wheel of the higher position and will rotate it to 1/10 (or 1/12) revolution. The carrying is not direct, but by means of intermediate pinion-wheel, which is placed in the same plane, as the one-tooth wheel of the previous digital position and with pinion-wheel of the next digital position. The lowest wheel actually is a ratch-wheel, and together with a rod and a spring forms a system, destined for fixing of the position of the digital positions mechanism. The small wheels-revolution-counters also have openings, by means of which can be rotated, thus resetting the wheels. Bellow these wheels are placed ratch-wheels, which are fixed by means of rod and spring. The transfer of rotation from main counter-wheels to these wheels is done by means of a special tooth on the big wheels, which once during a full revolution pulls a rod, which rotates to 1 tooth the ratch-wheel of the appropriate revolution-counter. Their digits are seen in the windows over the each wheel. The major fault of the first machine of Boistissandeau is the tens carry mechanism. The friction is huge and if it is necessary to be made several consecutive carryings, then must be applied a vast effort and the mechanism can be blocked or even broken. That's the reason in the second variant of the machine (see the figure below), Boistissandeau to change the tens carry mechanism. Here the tens carry mechanism is made by partial pinion-wheels (actually a rod with a attached a sector with several teeth in the edge). These rods are moved by means of a spring, which is connected with mechanism of the junior position. This system already has the advantages of the tens carry mechanism of the Pascalene, and allows the carrying to be done without any effort. 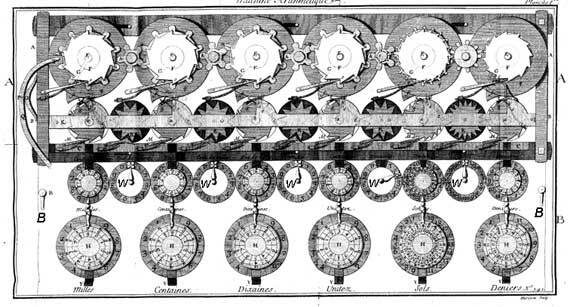 The similar mechanism is used for the wheels-revolution-counters. Another new element is the possibility to add mechanisms of new digital positions to the machine, and to change the mechanisms of the digital positions, which allows machine to be used for counting in different numeral system (monetary systems, weights, lengths, etc.). 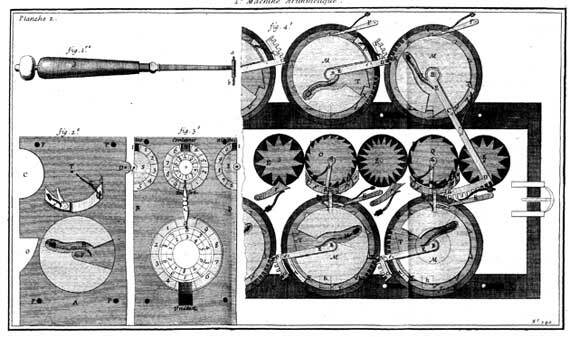 Later on Boistissandeau proposed a third variant of the machine (see the figure below), which has improved tens carry mechanism by lengthening the rod, which is stretching the spring, and decreasing the diameter of the pinion-wheel, which takes the carry, so it is required smaller effort during the carry.